Discussion in 'Parallels Desktop for Mac Feature Suggestions' started by SPX, Aug 22, 2017. Buying software for 79,99 and still get questions about other software i DO NOT want to purchase, put in in the trail version but not for people who has bought a license. JoseJ4, ChristianK12, HeikkiL and 19 others like this. I agree with you. I also found the pop-ups prompting me to install the Parallels Toolkit to be very annoying. I simply didn't want that junk. I would much rather have a rock-solid core product than a bunch of unneeded and unwanted embellishments. Unfortunately, Parallels is no longer a rock-solid product. Combining buggy software, hardware resource restrictions, and bloatware doesn't seem to be a winning strategy to me. I'm upset because : each new version is more intrusive regarding advertising. Since I have upgrade for the version 12.2.1 I can't use more than 8Go of memory as before and I have a message that say that I have to upgrade to the pro version if I want to use more than 8go of memory. Here is a crazy idea. What if you stopped displaying advertisements to customers who have paid good money for your product? Might make you look respectable! TOTALLY agree! I was about to make a post and include this ridiculous screen shot, but I'm glad someone already did. STOP this nonsense!! I did not buy your product for you to force Ads onto my desktop. GET RID OF THEM. Just because you are advertising your own products does not make it proper, it is just RUDE in the worst degree. If you treat your customers like dirt, they will return the favor. GET RID OF THE ADS!!! Okay Moderator, you win. I withdraw the quip that this feature is on a par with 1990's shareware. I still stand by my comment that this is both a product and marketing mis-fire. How about an opt out/opt in (permanent)? That could be a solution for all, those who want the offers (safe on bundle stuff) and the others (like me) who doesn't like the advertising at all. those who want the offers (safe on bundle stuff) and the others (like me) who doesn't like the advertising at all. It just got worse - they are trying to get Internet Explorer resurrected by sticking it in safari extensions to direct all webpages viewed to IE. 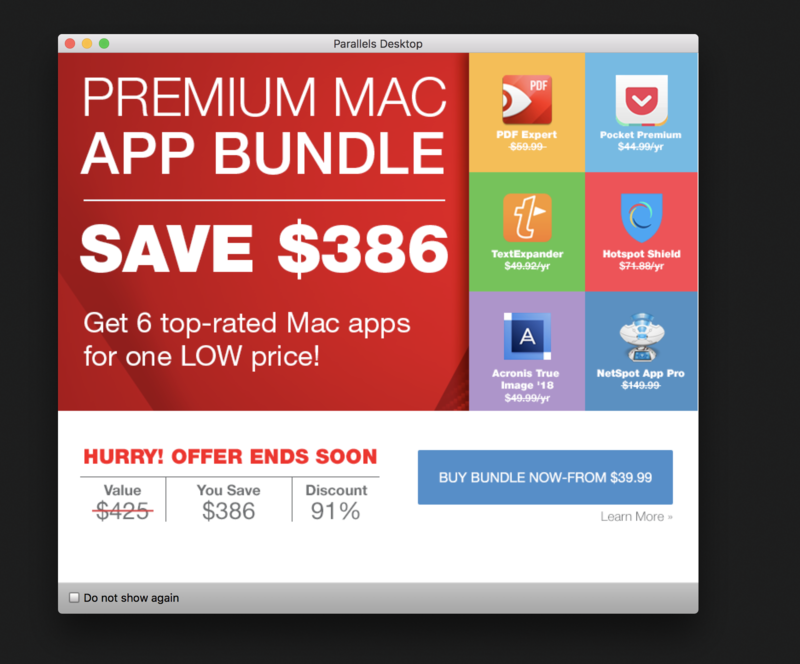 I was shocked and offended to suddenly get a popup ad in a Parallels wrapper today. Considering I just bought Parallels a few weeks ago, and then spent more money on Windows 10 for it to get rid of the customization restriction, I was very unhappy to suddenly get a popup ad! I have read from other threads this has gone on a long time and has caused people to use other VMs. Had I known about this I would have gone with something else also. This MUST STOP. Parallels, you must NOT advertise crap on a PAID product, it is very unethical and is costing you business. I will recommend to people not to buy this until I hear official word that this feature has been wiped clean of your paid product. Same here, I'm sick of seeing these adds trying to sell more software. I've paid for my subscription, I'm not using a free edition or anything like that. "We occasionally share special offers from Parallels or other third party companies who provide special deals for our customers. Many of our customers rely on the information about product updates and appreciate the special deals for products that are of interest to them. Individual notifications can be turned off by clicking the "don't show this again" button. However, because customers need to receive important product information, there is not a mechanism for customers to completely disable notifications. Thanks." "Please take in consideration your customers' suggestions. It's great to sell more, but not by upsetting your own clients with adds. Please, enable an option in your software where paid users can choose to avoid advertising. Thank you." Yeah! it's quite annoying when we have to put up with ads and pop-ups. I had to install some block ads software from top1apk.com. And, i think it works quite well up to now.